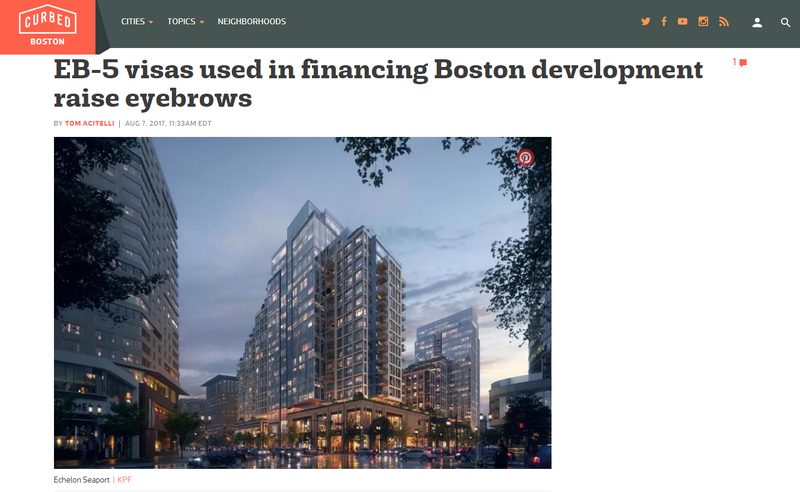 Some recent high-profile developments in Boston such as Fenway’s Pierce Boston and the Seaport’s Echelon have used a 27-year-old federal visa program that essentially trades foreign investment for green cards. Foreigners who invest at least $500,000 in a U.S. business that creates at least 10 jobs are eligible for the most investor-friendly form of the so-called EB-5 program. The only thing is that the business—or real estate project—must be in an area with an unemployment rate 1.5 times the national average. And there’s the catch: Per the Globe’s Tim Logan, developers in Boston are basically cobbling together oddly shaped tracts of land that skirt wealthier areas and engulf less affluent ones to hit that magic unemployment rate and therefore qualify to offer the EB-5.